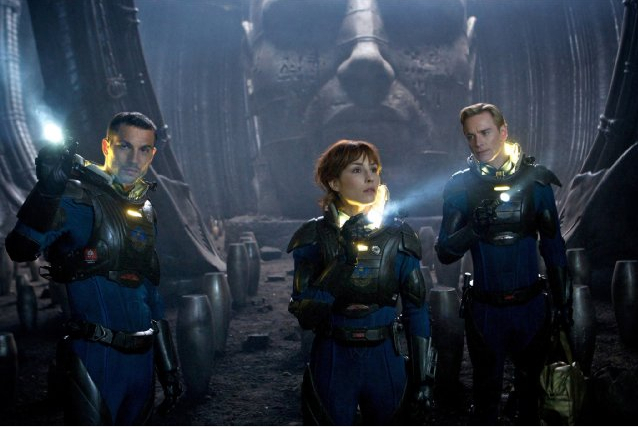 "Prometheus" is no "Alien," but it's undeniably awesome anyway. That's as in "inspiring awe," with scenes that range from the transcendentally sublime to the outright overwhelming. The screenplay by Jon Spaihts and "Lost" co-creator Damon Lindelof takes a lot of time setting things up, but the movie's horrifying and action-packed final-act frenzy is well worth the wait. Director Ridley Scott and others were coy during the making of the movie about how much "Prometheus" would have in common with Scott's 1979 SF classic "Alien." Fortunately, that noncommittal pre-release pretense was nothing more than misdirection. "Prometheus" very obviously is an "Alien" prequel, with characters, design elements, settings and a certain crescent-shaped spacecraft that will be deliciously familiar to fans. Several scenes in "Prometheus" even have direct analogs to events in "Alien," as if Scott couldn't resist recreating and ramping up those moments. Prometheus is a privately funded spaceship taking scientists to an Earth-like planet where they hope to find mankind's makers. "Alien"'s human-like robot Ash is mirrored here by Michael Fassbender as the coolly sinister robot David. Prometheus crew members discover a cavernous room filled with less organic-looking but equally nasty equivalents of "Alien"'s eggs. Prometheus archaeologist Elizabeth Shaw (Noomi Rapace), like "Alien"'s Ripley, is a tormented and terrified never-say-die survivor who spends part of the movie very vulnerably exposed. A huge dome on the hostile planet has bio-mechanically bizarre H.R. Giger-inspired architecture similar to "Alien"'s disturbingly creepy sets. The new monstrosities in "Prometheus" are every bit as nightmarish as "Alien"'s face-hugger and chest-burster, rendered with frighteningly squirm-worthy CGI magic. Also, a flamethrower is the unexpected weapon of choice for dealing with undesirables in both movies. A Prometheus character with no "Alien" equivalent is Meredith Vickers (Charlize Theron), the icy-hot corporate exec in charge of the trillion-dollar mission. Vickers is so bitchily businesslike that Prometheus Captain Janek (Idris Elba) eventually comes out and asks her if she's a robot. Sticklers may point out that everything about the Prometheus ship, the spacesuits, the technology and the holographic displays is more futuristically modern than anything in "Alien," which is supposed to take place years later. Then again, "Alien"'s Nostromo is a mining vessel that couldn't be expected to include top-of-the-line amenities, right? One place where "Prometheus" comes up short is its generic orchestral score by Marc Streitenfeld, which has none of the moving melancholy or menace of Jerry Goldsmith's work on "Alien." "Prometheus" also leaves as many questions unanswered as it addresses, making a sequel not only desirable but almost imperative. Director Scott stayed away from SF for 30 years after making only two movies in the genre. Both "Alien" and 1982's "Blade Runner" were masterpieces. Even with its flaws, "Prometheus" is a worthy successor to those landmark films.